Today is Ganesh Chathuti and everywhere I turn to is pictures of Lord Ganesha and so many varieties of Modaks! 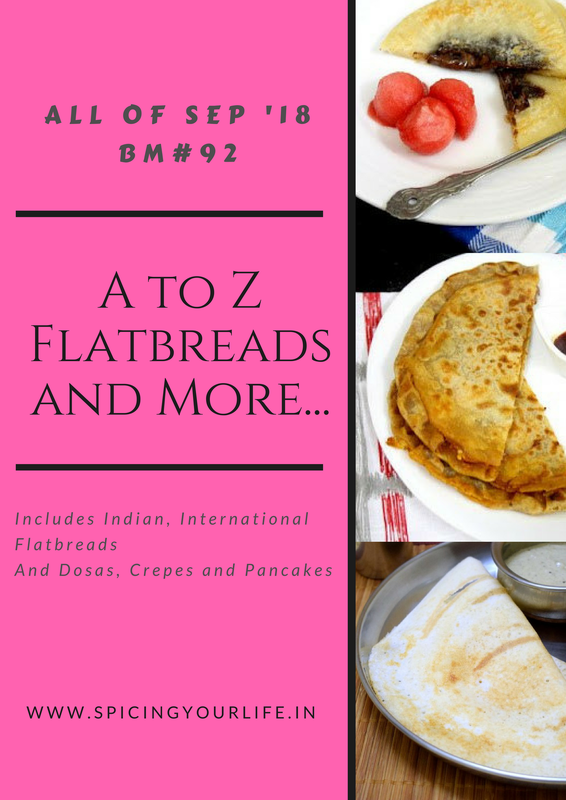 But in my space today I am posting this healthy Kuttu ka Paratha Recipe for the A-Z flat bread series that is going on throughout this month. This dish is vegan and gluten free and is absoultely delicious and needs no separate side dish.I served this with raita.Even curd and pickle will be a good side for this healthy dish. Kuttu or buckwheat is used in many parts of India to make dishes for the fasting period. I added some twists and made this healthy paratha that can be had on regular days as well. Some flaxseed meal, jowar flour ,kasuri methi and ajwain are a part of this paratha along with buckwheat flour. Until last year , I haven’t seen this buckwheat flour around here.Now I see them in so many shops. I buy small packs of this flour and try to include it where ever possible. I am still looking for Singhara Atta or chestnut flour in the shops here and hopefully I can get it sometime in the near future.I don’t buy groceries online as grocery shopping is a unique experience of walking the aisles of the store, browsing through the various shelves and finding some new ingredient to experiment. Anyway, I read a lot about this Chestnut flour and seen so many recipes with it and that has led me to look for this flour! So back to the recipe of the day…Both buckwheat flour and jowar flour are gluten free and in order to help the flours bind together to form a dough, boiled and mashed potato is used. The flavors of the various ingredients blend in so well that none of my folks could find out what went into this paratha! Take the mashed potato, jowar flour, salt,kasuri methi,flaxmeal,ajwain and buckwheat flour in bowl. Add water little by little and knead to a non sticky dough.Add a teaspoon of oil and knead again. Serve immediately with a side of your choice.We had this with carrot raita. A healthy Indian flatbread made with a combination of buckwheat and jowar flour and some spices. I agree with you…going shopping to a store is so much more enjoyable than shopping online. I made a buckwheat dosa and you have a paratha! Same pinch! Love this paratha…potatoes would make it so soft and tasty! I too love grocery shopping and at times spend hours over it – but recently I have shifted to online shopping and realise I save lot of time and also at times we see things which one might skip in a store . All said and done it is a personal choice and right now I am liking this kuttu ka Paratha, which is so soft and healthy . Grocery shopping should be done in person in my opinion. I love it too. But I understand why online shopping is helpful. Loving this healthy and gluten free paratha. Recently i have been dishing out couple of dishes with buckwheat flour. And am sure this paratha will definitely makes our dinner more nutritious and filling. Love the addition of jowar flour, potatos and flax seed meal. I generally use kuttu flour during navratris. Addition of jowar and flaxseeds has not only made it more nutritious but must have enhanced its taste as well. A healthy and yummy paratha. Great idea for kids and office luncboxes. Would love to dig in this now. A healthy paratha recipe and if I don’t add juar can make them for fasting days. Like your tip of adding boiled and mashed potato to bind the dough. You seem to be rolling out these rotis all so good. When the dough the is gluten free, I tend to pat them down. This combination sounds so good to try! This bread is perfect for fasting meal and good option for gluten free..
Kuttu ka paratha is one of the best paratha now for me. having this in normal days too benefits for better. Your paratha came out so well and with such a delicious spread feels hungry.